Bennington launched his first band, Grey Daze, in his late teens, before joining forces with Shinoda. Linkin Park’s debut album, Hybrid Theory (2000), was a “breakout hit,” said RollingStone.com. A “blend of rap, metal, and electronic music,” it made it to No. 2 on the Billboard chart and sold more than 10 million copies. 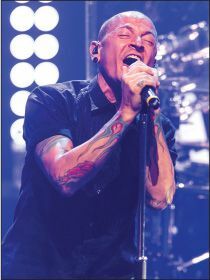 All but one of Linkin Park’s six subsequent studio albums have topped the charts; in 2004, they “teamed with Jay-Z on the platinum-selling Collision Course EP.” Between 2013 and 2015, Bennington also stepped in for Scott Weiland as the frontman for Stone Temple Pilots, a band he’d worshipped growing up.